The Butterfields: Whats wrong with this picture? 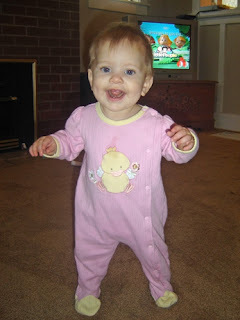 Madi can stand for about 30 seconds unassisted. I guess the next step would be for her to take a step. I think I will nail her feet to the ground so that can't happen. Wow amazing Krysten! Make her stop it now, no growing up allowed! !